Bi/Sn/Ag: The Perfect Tabbing Ribbon Coating Solder Alloy? The particular bismuth-based solder alloy that is most commonly used for c-Si cell tabbing consists of 57% bismuth, 42% tin, and 1% silver. This alloy melts at 139-140C, which is considerably lower than the Pb/Sn, Pb/Sn/Ag, and Sn/Ag alloys (179-221C) that are common for tabbing ribbon. This low-temperature melting point allows lower assembly (soldering) temperatures. Lower assembly temperatures are incredibly important when dealing with silicon solar cells, since there is a large coefficient of thermal expansion (CTE) mismatch between the cell and the copper core of tabbing ribbon – which are rigidly attached during soldering. The second point is very simple: Bi/Sn/Ag is made without Pb and Cd, and conforms to Pb-free and Cd-free mandates. Points #1 and #2 are fairly straightforward, but beneficial mechanical properties will need some explanation. Here I will rely on testing to tell the story. 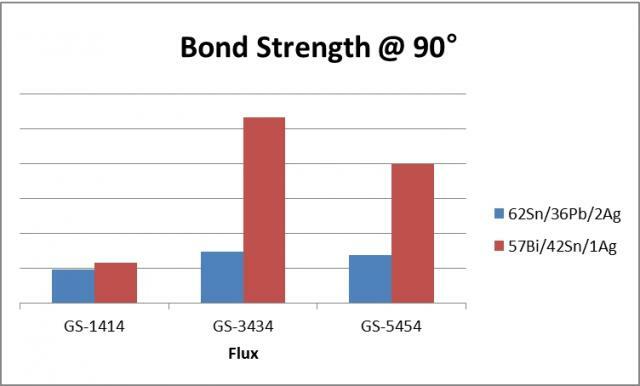 Seen here is a chart that shows the incredible increase in bond strength between traditional Sn/Pb/Ag (which still retains ~200% peel test criteria) and Bi/Sn/Ag solder alloy. I’d be happy to discuss the reasons for this increase in bond strength with you offline. You can email me at jhisert@indium.com.